IMG_1100, originally uploaded by All Things Mimi. 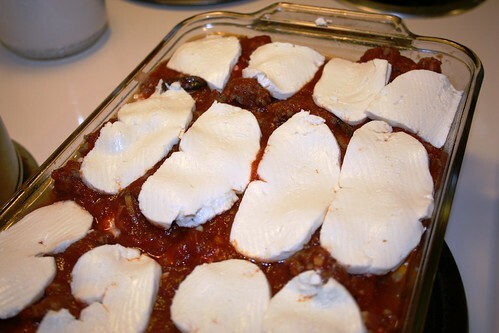 This is a pic of the lasagne I'm making for tonight's dinner. Dev was hard at work all day, making mozzarella and ricotta to make this dinner possible. I have noticed a few differences between home made moz. and store bought moz. On the positive side, home made moz. has more flavor, and is much less rubbery. On the negative side, it doesn't melt the same way store bought does. It doesn't really melt and spread. I think this may mean we need to knead it more during the processing, or perhaps there is something else we could do. If anyone out there is familiar with making moz. and would like to offer some suggestions, I'm all ears. I think that kind of Mozarella that spreads is a slightly different kind of mozarella and processed differently - maybe you could combine the home-made moz with a someother homemade "meltier" cheese.